Speaker Socials are held on the second Thursday monthly at the Harlingen Public Library at 6:00 pm and are free to the public. ACAS field trips meet the following Saturday at Hugh Ramsey Park at 7:30 am to car pool to birding locations. Entry fees for some parks apply. Free for members, a $5 donation is requested from non-members. Birder Patrol Trips - Take place on the fourth Saturday of the month. 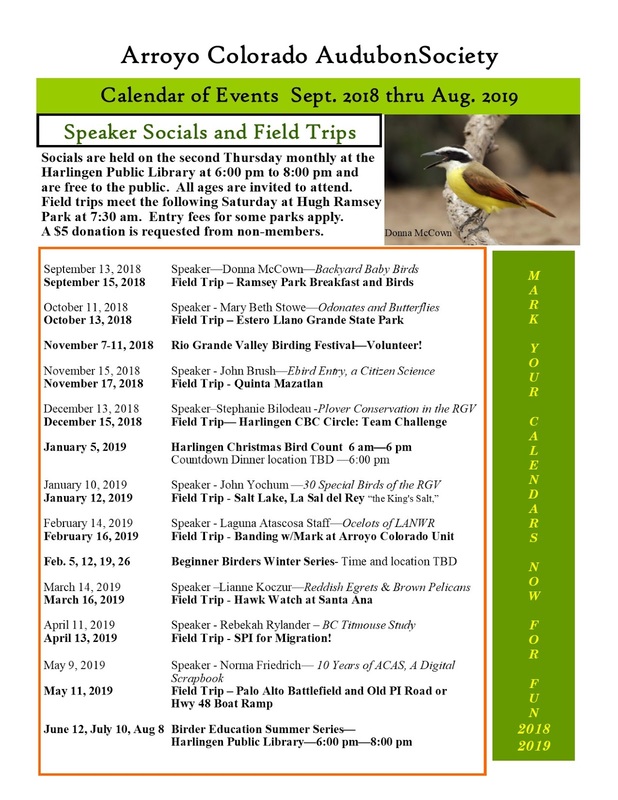 Destinations of field trips are decided 7 to 10 days prior to the date and announced by email, Facebook and through Texbirds. Often led by top notch birders Mary Beth Stowe and Pat Heirs these trips request a $5 donation benefiting the Education Programs of ACAS that include the February birding classes. All Classes will be free and open to the public. Meet Tuesdays in February at the Harlingen Cultural Arts Center at 576 ’76 Drive (next to the City Library) at 9:00 am. Bring binoculars! If you do not have binoculars, we will have some available for your use. Learn to use and care for your optics. We’ll cover the ABA’s Birding Code of Ethics and How to get started Birding. A real-time, online checklist program, eBird has revolutionized the way that the birding community reports and accesses information about birds. Clay Taylor of Swarovski Optiks will present a demonstration on Digiscoping - providing opportunities for practice, bring cameras. Bird ID and Anatomy 10-11 am Learn to distinguish species by profiles, physical details, field marks, habitats, behaviors, and a bit of bird anatomy. eBirding II Join our expert users as we explore how to edit and keep track of your checklist or share you checklist with others in your group. Learn to find what birds are being seen in a given Hotspot or where a species has been seen. Discover how you can create reports and how the data entered by eBird users all over the world is being used. Birds of the RGV you should know. Join us to find out which bird species are special to the Valley and easy to find and ID. Parrots of the RGV Come learn about parrots of Harlingen and the RGV. Learn about the research that is being conducted and how you can help. Putting your ID skills to use Join us on a Field Trip to practice the skills you have learned. We will use binoculars and guides as well as ID skills to find and identify common local birds. Join us to review the birds most likely to be encountered during Spring migration in the RGV. Learn to differentiate between similar species and to recognize females and juveniles.